Dylan’s Oyster Cellar finds its home on The Avenue. When Dylan’s Oyster Cellar shuttered its subterranean pop-up in the heart of Mount Vernon in 2014, we feared for our stomachs, and our social lives. One of the first of its kind, the temporary space had quickly become a hip local favorite—more Brooklyn than Baltimore for its time—and we dreaded the loss of its Old World cocktails, ice-cold oysters, and fan-favorite house-cured sardines. But now, with the local restaurant scene on the rise, the timing couldn’t be better for the opening of owner Dylan Salmon’s new permanent space. At the east end of The Avenue in Hampden, the cozy hangout returns with its same speakeasy style that beckoned you inside past the hand-painted, gold-leaf sign. With warm lighting, mosaic tile, and a musical medley of conversation and clinking glasses, prepare to be transported to 1920s Paris or New Orleans. Intimate and charming, the former flower shop has a fitting connection to Salmon—his wife, Irene, recently retired as a floral designer at Local Color Flowers in Charles Village. Now presiding over the front-of-the-house, she adorns the tables with fresh blossoms and even hand makes the earthy clay vases that hold them. But besides the ambrosial setting, all traces of the former tenants are gone. From the moment it opened, Dylan’s has felt like a neighborhood haunt, its J-shaped bar always bustling as patrons gather for after-work snacks, full-on suppers, or boozy, late-night noshes (the raw bar is open until 2 a.m. on weekends). We’re obsessed with the thin-walled beer glasses that seem to somehow make the brews taste better, but we can’t resist the craft cocktails that look like mini pieces of art, or the worldly wine bottles that come half-priced on Tuesday nights. Whatever your poison, the bistro barstools award you a front-row seat to the master shuckers who artfully shell your oysters and clams. 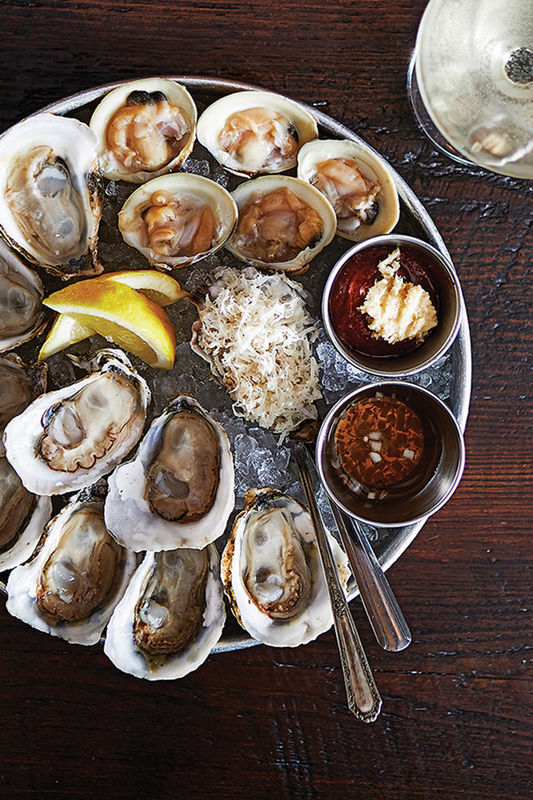 As a seasoned and competition-winning shucker himself, Salmon’s ever-evolving bivalve list highlights the best of both coasts with at least two local options, like Skinny Dippers from St. Mary’s County or Barren Islands from Hoopers Island. 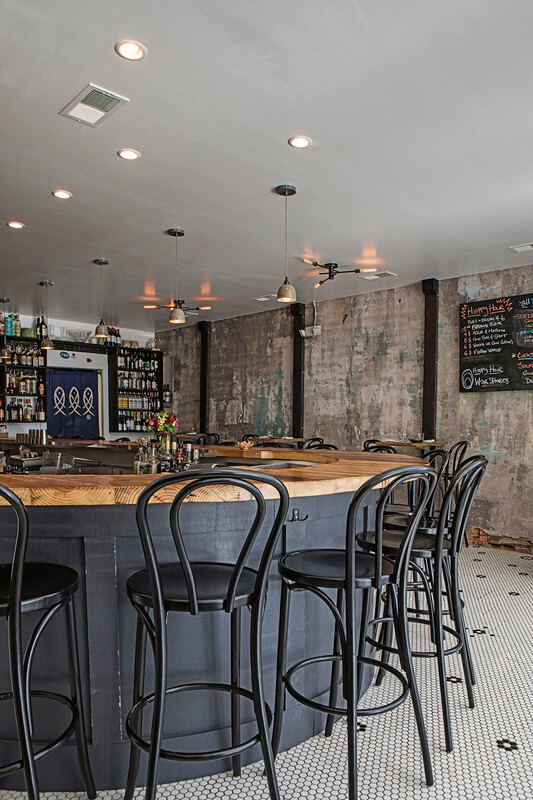 But Dylan’s Oyster Cellar is more than just an oyster bar. Curated by chef Karl Diehn, formerly of Woodberry Kitchen and Bottega, the simple menu is full of stunning dishes fit for both the seafood-averse and the adventure-seeking ostreaphile. With a smattering of small plates and a handful of entrees, each offering is an elevated take on seafood shack classics or midcentury American cuisine. On a recent visit, we savored a round of East Coast oysters and some Baltimore coddies—an age-old regional recipe, also known as the poor man’s crab cake. The crispy classic combines salty cod and mashed potatoes into a fried comfort food that’s best eaten between saltines with a smear of yellow mustard or, in this case, an addictive dijonaisse. Each offering is an elevated take on seafood shack classics or midcentury American cuisine. While you're there, consider the clams, which come four ways including on the half shell or roasted with butter and Parmesan. The scallop crudo was almost too pretty to eat, gently placed on its seashell with olive oil and herb blossoms. For a second course, the crab imperial, served in a tin-foil crab shell atop a paper doily, was a beloved throwback, reminiscent of our grandmother’s cooking. The luscious lump crabmeat came broiled with little more than a wedge of lemon and we lapped up every last bite. The seasonal specials are also worthy, focusing on local produce and timely proteins, like the summery soft-crab sandwich topped with fresh tomato and homemade tartar. Just beware: Popular dishes do sell out. But the star of the show—the dish that diners ogled over as it was whisked past their seat—was the whole rainbow trout. Butterflied, deboned, and swimming in a savory brown butter sauce, the pan-fried fish is a melt-in-your-mouth delicacy that’s reason enough to visit. Snap an Instagram and then follow Dylan’s on social media, as Irene updates the restaurant’s story with behind-the-scenes videos, nightly menu items, and the daily weather. With the lampposts lit along The Avenue and The Charmery dishing out the day's final scoops of ice cream across the street (Dylan’s offers dessert on weekends only), we sat admiring the hustle and bustle of Hampden in a sort of intoxicated daze—be it from the aphrodisiacs, the booze, or both. Had we time-traveled à la Midnight in Paris? Hopefully not, because we plan to return soon. DYLAN’S OYSTER CELLAR 3601 Chestnut Ave., 443-853-1952. HOURS Raw bar: Tue.-Thu. 4 p.m.-midnight, Fri.-Sat. 4 p.m.-2 a.m., Sun. 2-9 p.m. Kitchen: Tue.-Sat. 4-10 p.m., Sun. 2-8 p.m.
PRICES Appetizers: $2-21; entrees: $13-21. ATMOSPHERE European bistro meets East Coast seafood shack. We talk to the restauranteur about his new Italian-inspired spot in Station North.